10 am. Pick up at the hotel; meet Daniel. 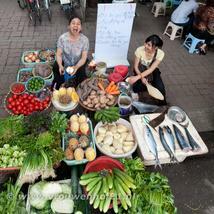 Daniel will take you to see some of the markets and establishments that are frequented by the Vietnamese locals. Most of the tour will be outside of the tourist areas that are listed in the guidebooks. 10:15 am. Drive to the Chợ Hôm or Châu Long market to learn about and taste some of the ingredients used in the local cuisine and to watch the buying and selling rituals of a Vietnamese market. Daniel will introduce you to some of the vendors, explain about the ingredients for sale and assist you with purchasing items to take home. Many photo opportunities will be available in this bustling, vibrant and colorful scene. 12 noon Drive (or walk) to Truc Bach lake for a snack of Phở Cuốn, a grilled beef and rice noodle roll with fresh herbs, along with several other favorite local snacks. 1:15 pm. Lunch with Daniel at one of Hanoi’s bún chả establishments, to enjoy traditional grilled pork and rice vermicelli noodles with fresh herbs, greens and crispy spring rolls (nem ràn) like true Hanoians. This is a sample itinerary and is typical of the street food tour. Daniel may change the locations to take advantage of the season or one of his latest discoveries. The itinerary can also be customized to suit guest's particular interests and dietary restrictions. The times are also flexible. For evening tours, some of the locations and food selections will change since certain foods are only available at specific times and locations.